We’d love your help. Let us know what’s wrong with this preview of Soldiers’ Songs and Slang of the Great War by Martin Pegler. Have you ever "gotten dirty at the crossroads" in a "knocking shop"? Or been in a "bun-fight"? Can you sing "I Wonder Who's Kissing Her Now? ", "Bicycle Built for Two" or "Danny Boy"? 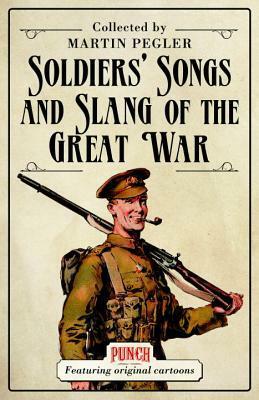 Soldiers' Songs and Slang of the Great War explains the meaning and origins of the language and songs of WW1. A bawdy and satiric celebration of cheerful determination in the face of appalling Have you ever "gotten dirty at the crossroads" in a "knocking shop"? Or been in a "bun-fight"? Can you sing "I Wonder Who's Kissing Her Now? ", "Bicycle Built for Two" or "Danny Boy"? Soldiers' Songs and Slang of the Great War explains the meaning and origins of the language and songs of WW1. To ask other readers questions about Soldiers’ Songs and Slang of the Great War, please sign up. A very informative and interesting read. An easy yet detailed comprehensive read that gives one tidbits and random facts about the Great War as well as the mood and view of the war, especially from the view of the fighting man in the trenches. The songs are also nice to read through to see how humor and the strain between officers and enlisted men was portrayed back then. Martin Pegler embraces their earlier work, which, due to censorship, had to omit much of the slang verses of songs, which had been considered at that time too crude for inclusion even a revised 1965 version was heavily edited. This doesn’t mean that Martin Pegler’s up-dated version is crude, it isn’t, it’s a fascinating journey that gives an honest, true-to-life collection of songs, fabulous illustrations and, of course, a dictionary of slang used by the soldiers who endured trench life. The alphabetical list of Military Slang, Terminology and Popular Phrases encompasses an enthralling lexicon from AAA – Ack, Ack, Ack – ‘Stop’ on a Morse buzzer, to a Zig-Zag – a drunk - from the wobbly walk of a man full of alcohol. There are almost two hundred pages of discovery here. As a writer and researcher of this era, I have found Soldiers’ Songs and Slang of the Great War to be a treasure chest of enlightenment and would like to thank Martin Pegler for sharing his knowledge in this superb book. The first half of the book (with the slang) was very interesting. I also enjoyed many of the cartoons. I didn't much care for the songs, but they just didn't interest me without a tune to go along with them. Not my thing. Perhaps others would find that as interesting as I found the slang. The one thing that really stuck out to me was how often the WWI slang made words longer rather than shorter, which is the normal trend. They also tended to rhyme with the last word There were many examples of th The first half of the book (with the slang) was very interesting. I also enjoyed many of the cartoons. I didn't much care for the songs, but they just didn't interest me without a tune to go along with them. Not my thing. Perhaps others would find that as interesting as I found the slang. I really liked the book, but I would have liked a bit more background information. I think it would have been far more interesting to find out a bit more on each song or bit of slang. That being said, I did learn a few interesting things and now "Over There" and "Mademoiselle from Armentieres" are running through my head!